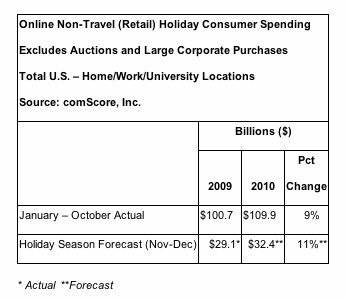 According to a report from comScore consumer spending online for the Christmas season is already surpassing pre-recession spending. So far in November consumers have spent 13% more than last year. comScore asked a series of questions to 500 shoppers and one of the more interesting answers was that most of them actively seek free shipping, in fact 33% said that they won’t make a purchase unless it ships for free. Read the story from cNet here.